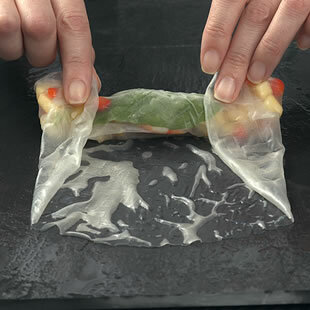 Spring rolls can be fresh (as pictured) or fried. Fresh spring rolls are filled with ingredients that can be eaten raw, such as shredded carrots, bean sprouts and fresh herbs, or ingredients that have been cooked before—shrimp, smoked salmon, cooked tofu. Spring rolls look impressive when you put them out for a party, but they are actually easy to make. 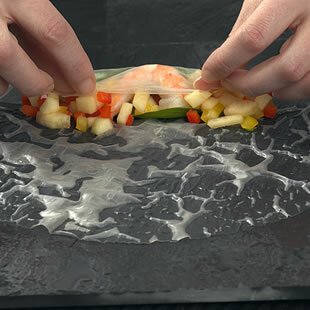 To simplify the process, lay out all the ingredients you need to make the rolls near your work surface before you begin. 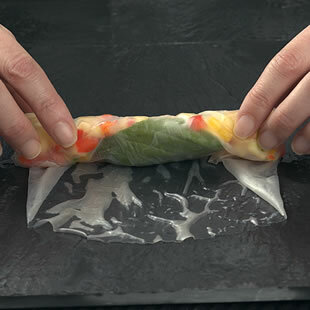 Soak one spring roll wrapper at a time in a shallow dish of very hot water until softened, about 30 seconds. 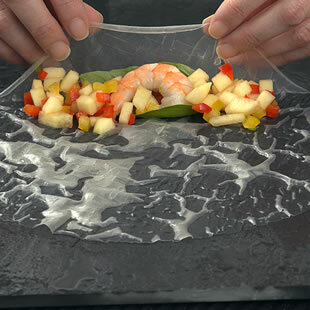 Lift out, let excess water drip off and lay on a clean, dry cutting board. Center ingredients in the bottom third of the wrapper, leaving a 1-inch border on either end. Fold the wrapper over the filling. Start rolling into a tight cylinder. Stop rolling about halfway to fold in both sides. 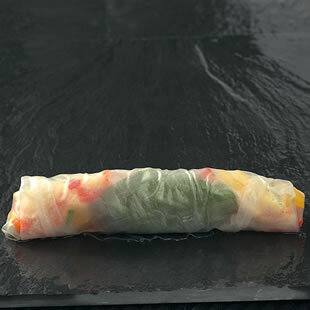 Continue rolling until the spring roll is a tight cylinder. Assemble the remaining spring rolls the same way. 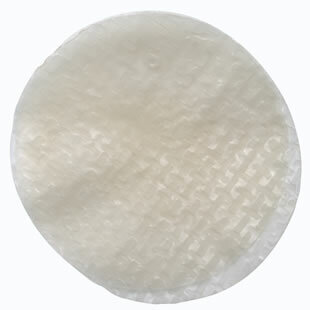 Keep the finished rolls covered with a damp cloth to prevent them from drying out. Cut each finished roll in half just before serving, if desired.